Snug as a bug in …. At the living end of the house we have the new studio/family room, kitchen and then on the southern end of the kitchen is what would have been used as a dining room. We decided to make it a snug two seated livingroom/tv room. 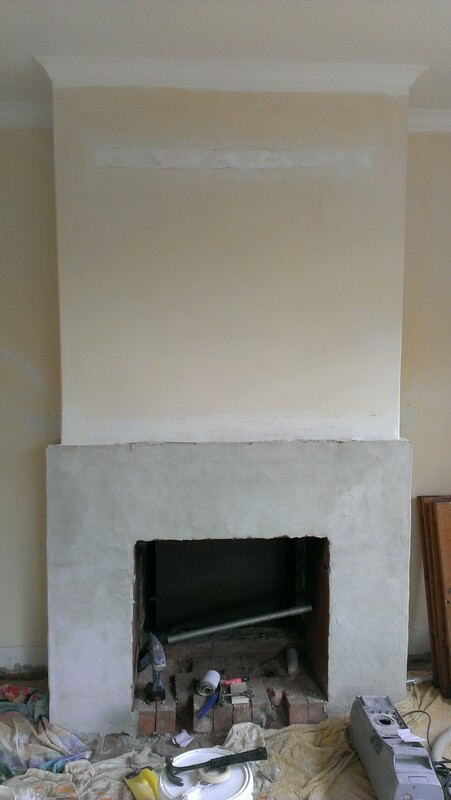 First up we removed the mantlepiece and fake sandstone. Then rendered the brickwork and painted the whole lot with a yellow textured paint that we used in the office and what was the sitting room but has now become our bedroom. Then the research into fireplaces started. 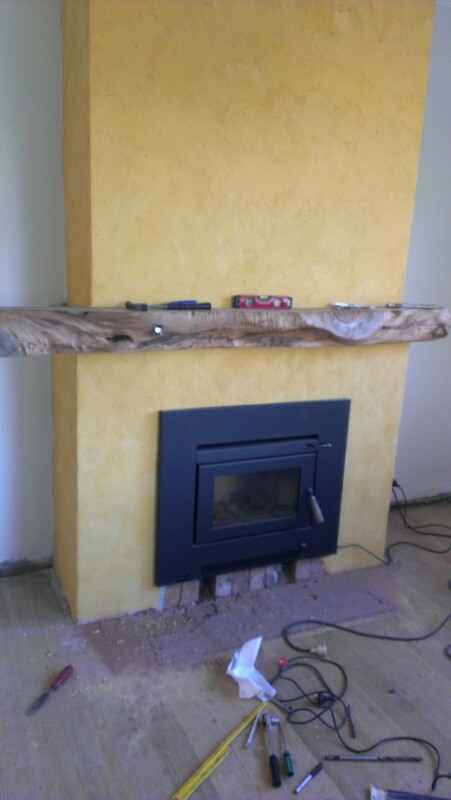 I was looking for the most efficient insert woodburner that I could find. The legal rquirement in Australia is for a heater to emit less than 4g of particles per kilo of wood burnt. We found all the heaters did this but few were less than the maximum and fewer cared to mention their emissions testing. After much looking around we came across a brand called Aranbe made in Victoria (not China like many) very approachable I gave them a call and asked about the emissions etc. Their insert woodheater emits a very low .7g per kilo. That was great. 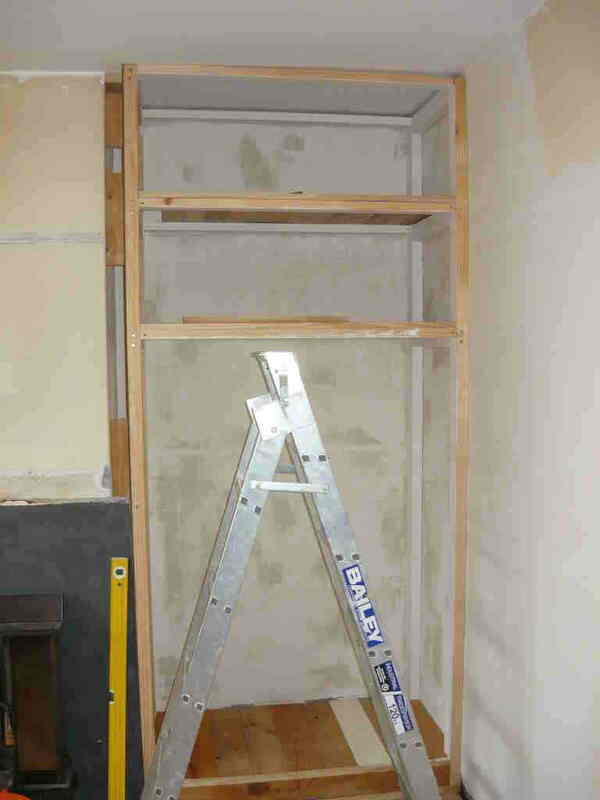 We had it fitted by Newmans of Devonport who arranged prompt and efficient and reasonable priced fitting. After the normal washing and sanding of walls, ceiling etc we repainted with clay paint, added cornice to match the kitchen, redid the skirting, repainted window frames and commissioned a new cupboard from Michael Thomson who built our kitchen. That left the question of a new mantlepiece. My mate Lee had left the state and when he did so he gave me some great off cuts of cypress pine. they were the splits left after cutting planks. One made the front of the mantlepiece and the shorter one made the two returns. teamed up with a large mirror frame given the metal and rust treatment and the whole room came up really well. Michael arrived with the new cupboards, we clear comforted the windows and re-installed the leadlight lampshade. 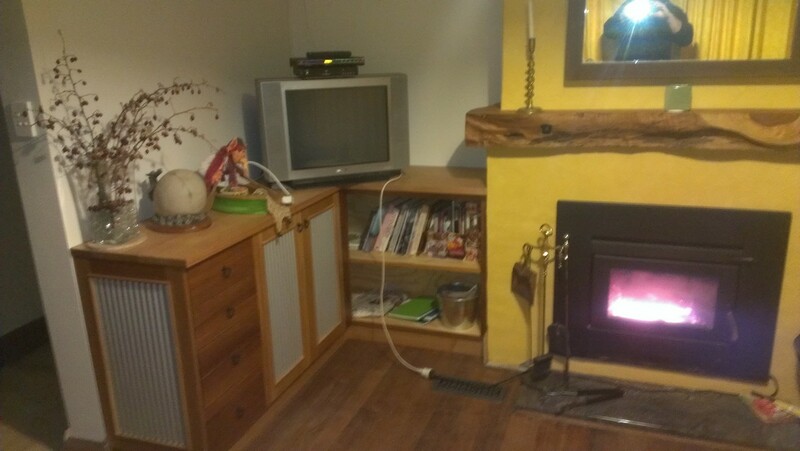 On the right hand side of the fireplace was another nook. It was just the right size for our log box on wheels. This means that we can easily wheel our logbox out onto the deck and load up with firewood without too much manual handling. Above this is a shelf that I constructed from left over pieces of LVL beams which I biscuit jointed together and sanded back and waxed. Quite a different look with all the layers of plywood showing. The hearth was a nasty piece of concrete with brown tiles. We replaced it with a piece of polished granite from Dunnstone in Launceston who do a great range of polished stone, grannite and marble. It’s a wee bit funny this renovation lark. Looking back on the year we have been fairly busy. Grid connect solar systems, plans through Council, a great relationship with Owner Builder Mag, three rooms renovated, the front of the house almost finished, new veggie beds and a motorhome parking area to list a few of the things we have established. 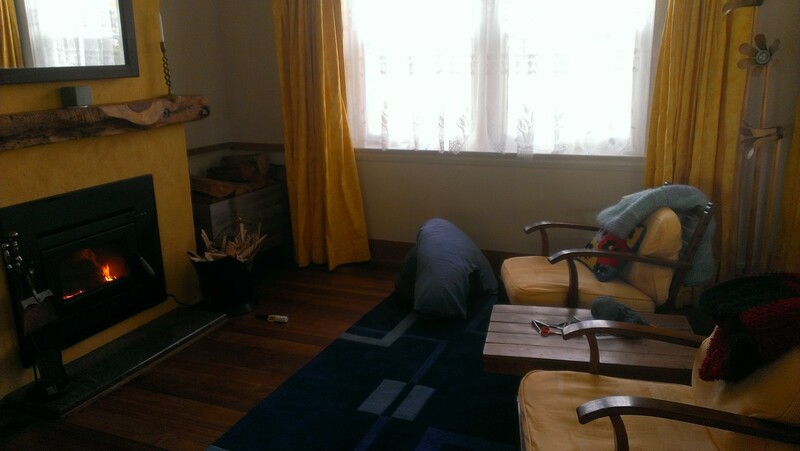 About six weeks or so before Sustainable House Day we decided to renovate the Living Room. This is to be our living room for a while and then will eventually become the master bedroom. The thing was, as is the same in the rest of the house, NO STORAGE! so we would have to build some built-ins either side of the chimney. 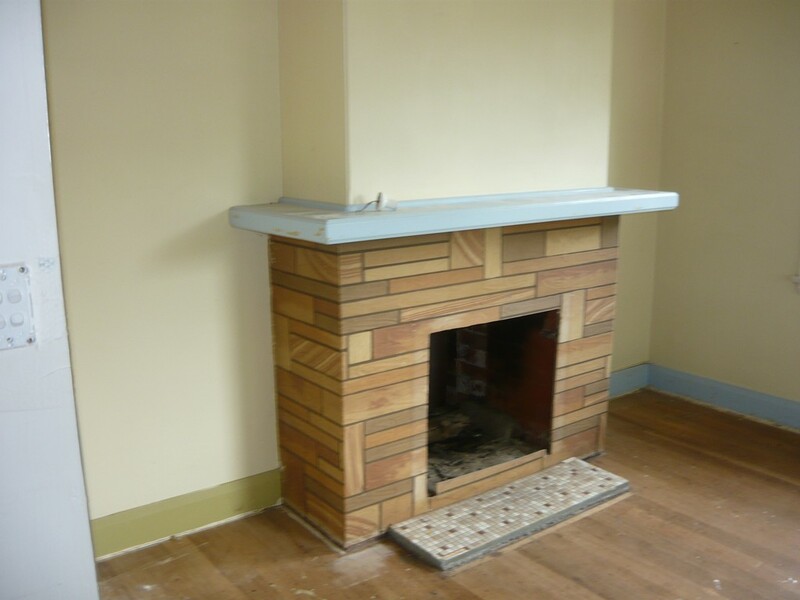 Eventually the fireplace is going to be taken out and put on the opposite side in the present day dining room. We stripped out all the furniture and piled it all up in the spare bedroom and crammed in the TV, electric heater as it is mid winter. This became our temporary living room. 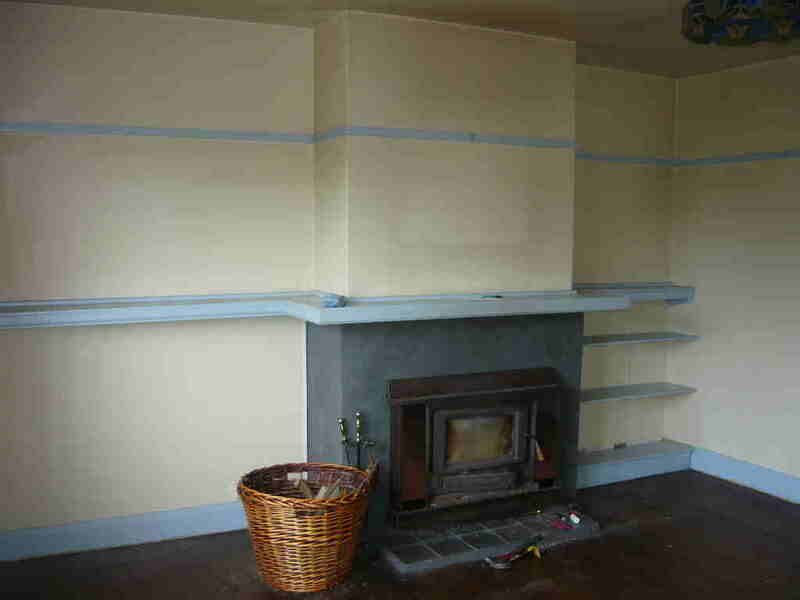 Then came the job of removing the mantelpiece and rudimentary shelving that had been added at some time. 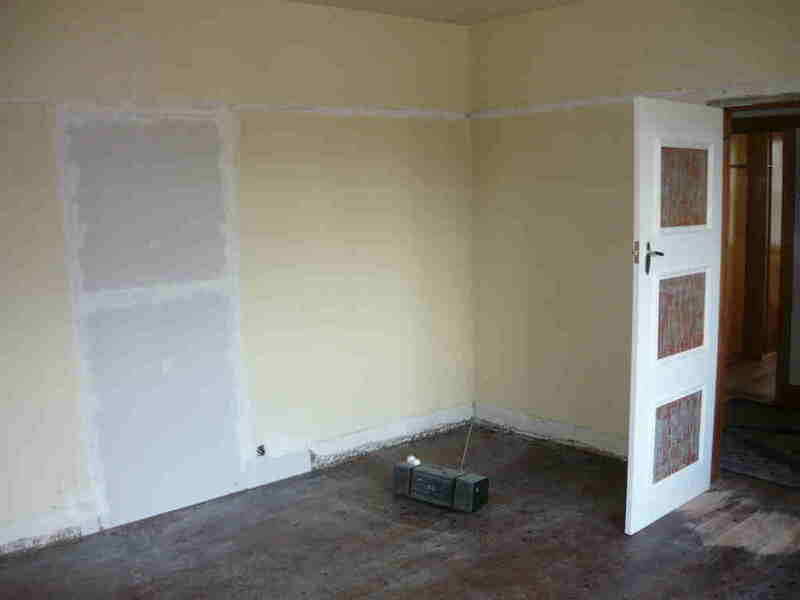 The doorway into the long hall was filled in and a texture added to the plasterboard to match the textured plaster that goes right around this room. The ceiling was really grotty with smoke and grime. Sugar soap and a mop took care of that with a couple of coats of white clay paint. The built ins were next. This took ages as the ceiling, being lath and plaster was subtly uneven and nothing is square. We used masonite as the cladding as we had discovered that Masonite is made from only hardwood sawdust compressed under heat until the natural lignite in the wood creates the substance that holds it all together. No nasty glues!! It is made in Australia by Australia Hardboards and used for all sorts of things such as wall panelling, under vinyl, bracing and pegboard. I used my trusty thicknesser to dress the tassie oak boards that had been used as the mantlepiece originally and oiled it with the Volvox hard wax oil. Shelves were made from offcuts of pine flooring that we have carried around for ages, we faced these with dresses fence palings. 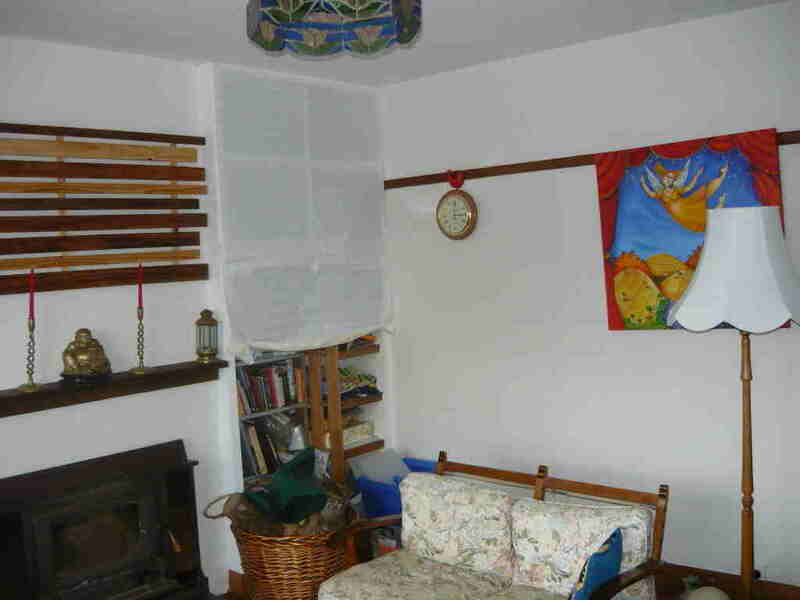 It seemed to take weeks and weeks but eventually the built-ins were built in, the floors sanded, walls painted, picture rail made from the strips of tassie oak that were around the room plus another layer that were originally in the entrance hall. We moved all the furniture back in all in time for Sustainable House Day in September. The finishing touch for now was a mixed wood panel to hang above the fire place. This will allow a flat screen TV to be hung if that is wanted. Power and arial were wired into one of the wardrobes as well as a new power point near the filled in doorway. 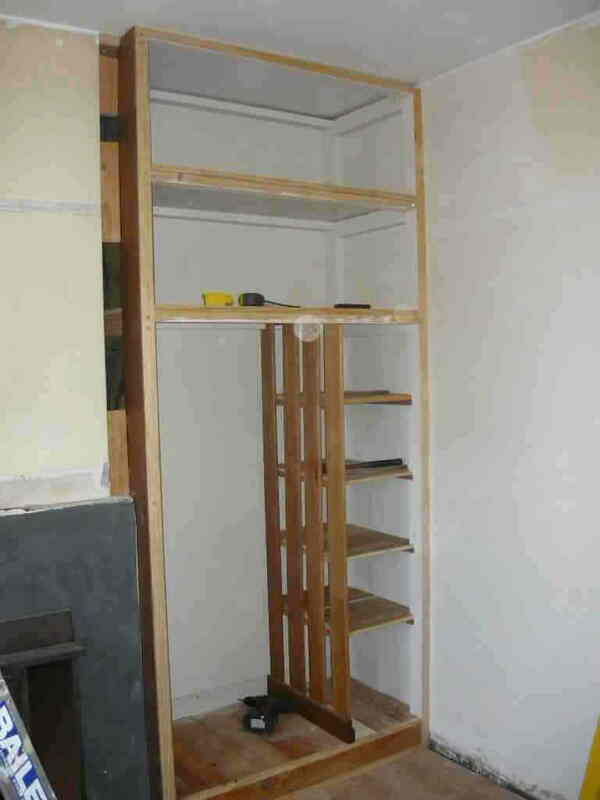 The last thing to do is to design and make the doors for the built ins.